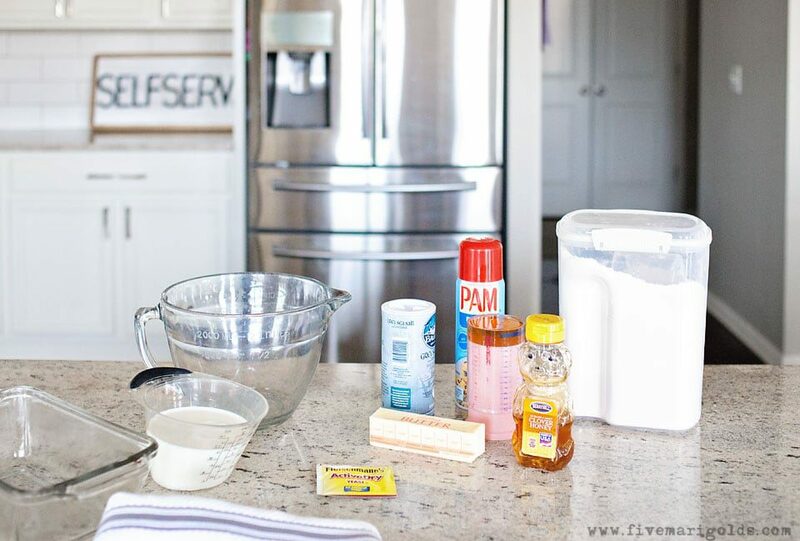 Today I’m excited to share one of our family’s favorite recipes: Kid Friendly Honey Bread. 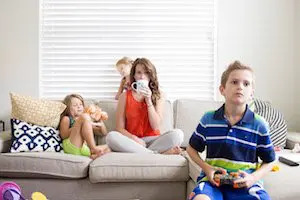 I’ve been meaning to share this on the blog for, like, years, but just never got around to it. Yes, the recipe is called kid friendly because my kids love to eat this bread. But, more importantly, this is a super easy recipe that your kids can make with you. I tend to be intimidated by many bread recipes. In my experience, if you don’t get things *just so*, or if you don’t have a bread maker or kneading machine, the results can vary each time you make it. Not the case with this recipe. 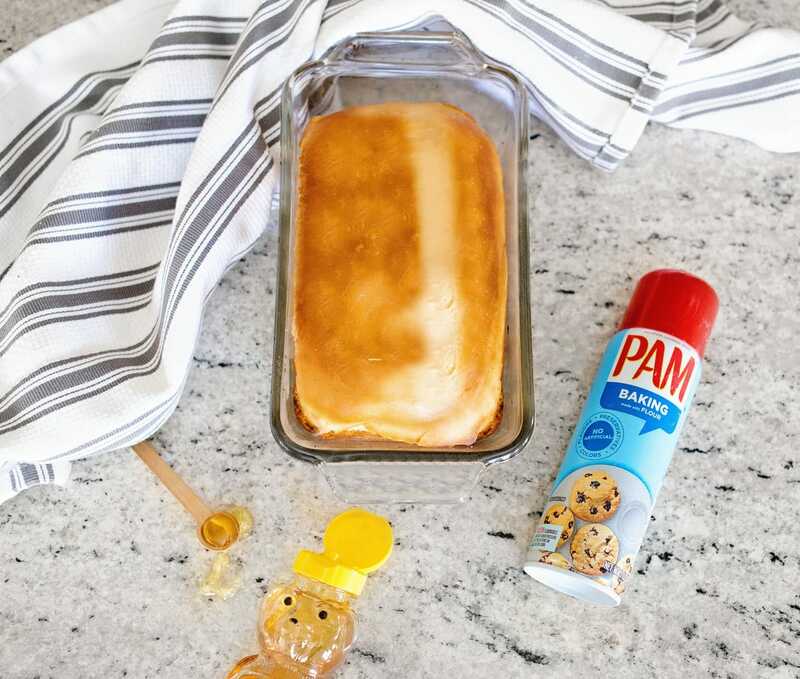 This honey bread turns out every. single. time. Even better? It uses simple ingredients you probably already have in your pantry. No bread flour needed for this one. Start with 1 1/4 C. milk, warmed to 110°-115°, and dissolve one packet of active dry yeast in it. Stir in 1/4 C. honey, 2 T. melted butter, and a dash of salt. Then, add 3 C. all purpose flour. The dough will be sticky! Knead on a floured counter or in your mixer using a kneading attachment for around 3 minutes. Place in a bowl, cover with a towel, and let rise in a warm place for one hour. Punch down the dough, place in a greased bread pan, and let rise one more hour. Now you’re ready to bake! Place in the center rack of your oven and bake at 375° for 30-35 minutes. The result is golden, delicious honey bread. 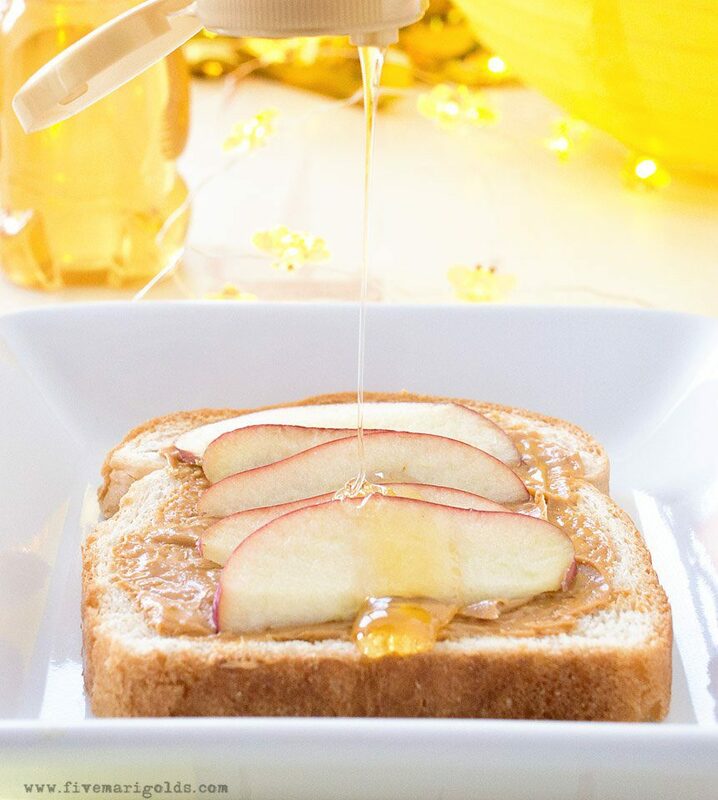 We love to serve it warm, drizzled with honey (of course!). 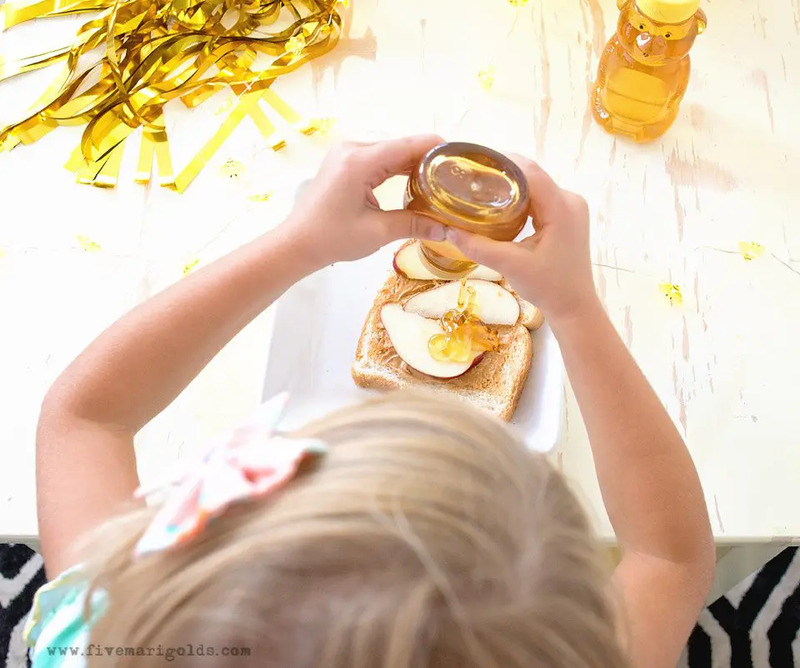 I just know you’re going to love this kid friendly honey bread recipe! It’s perfect for breakfast, or the perfect side to your next meal. Please give it a try and let me know what you think! Then, check out more inspiration on YouTube and Pinterest! Dissolve active dry yeast in warmed milk. Add honey, melted butter and salt. Knead on a floured surface or with a dough hook in an electric mixer for three minutes. Place in bowl, cover with a towel and let rise in a warm place for one hour. Punch dough down, add to greased and floured bread pan, and let rise another hour. Serve warm, drizzled with honey. 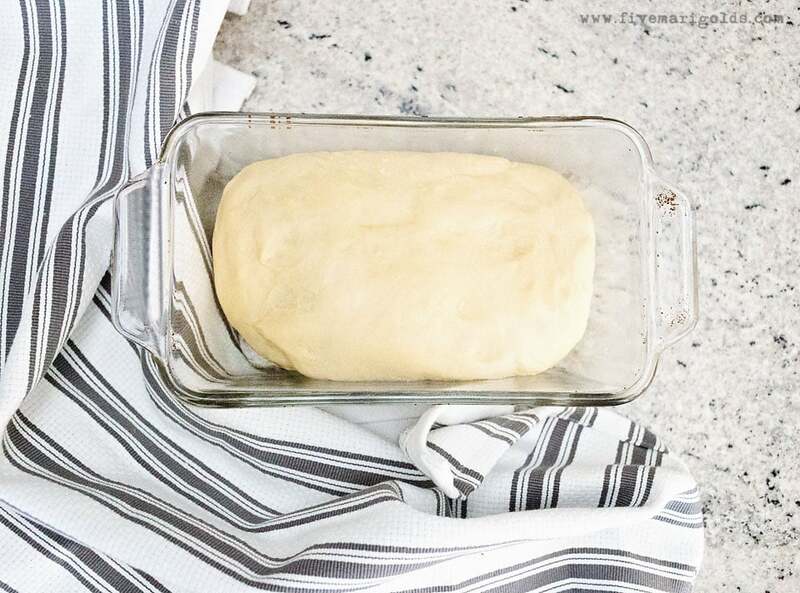 Do you make bread at home, or are you intimidated by the process? Let me know in the comments below! This looks beyond yummy! 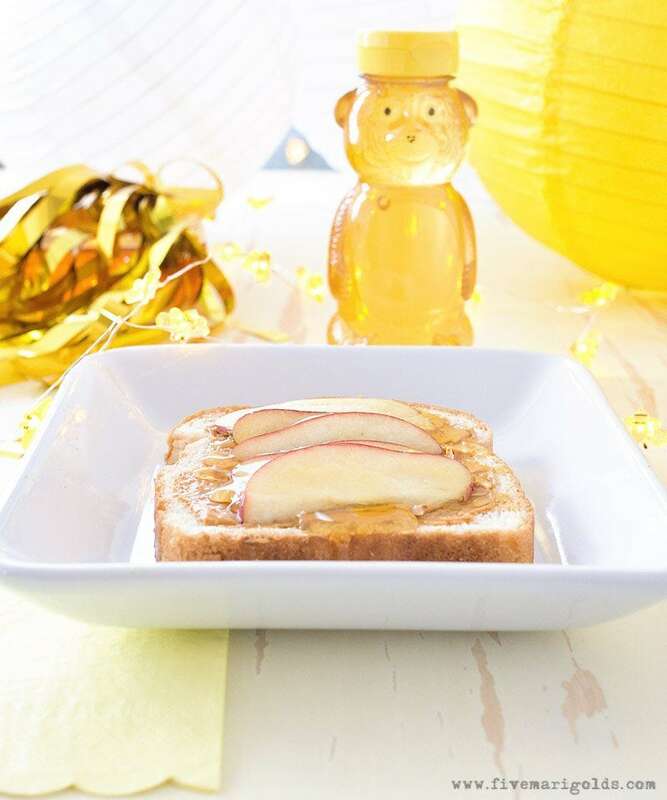 I love honey and Bread so definitely will be trying this! I love homemade bread and honey bread sounds delicious! Am definitely going to have to try this recipe! Homemade bread is one of my favorites and you paired it with such great toppings! Definitely going to have to make this! I love making homemade bread. I usually use a bread machine to kneed and proof my dough, but it recently broke! Sadness and woe!